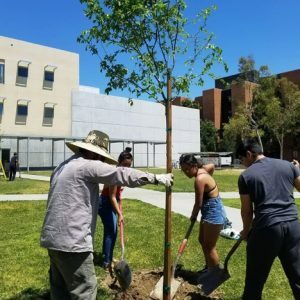 In order to engage the community in resilience assessment and future planning steps, California State University Northridge (CSUN) implemented a demonstration-scale tree planting on campus. Students and community members participated in the tree planting, which was held during the annual Earth Fair on campus. The volunteers planted 26 trees. Trees provide increased canopy coverage, which aides in decreasing the urban heat island effect. For this project, Chinese Elms were chosen because they are drought tolerant and quick growing shade trees. These trees will eventually shade walkways, providing relief from heat for pedestrians. They will also shade nearby buildings, reducing cooling needs. Student and community volunteers plant trees on CSUN’s campus. 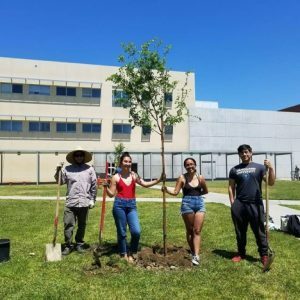 All 26 trees were planted on CSUN’s campus. The interim Director of the Institute for Sustainability and the Sustainability Program Manager were responsible for coordinating this project, with assistance from CSUN’s Physical Plant Management. The trees were planted by 15 students and community members. The Sustainability Office informed students and community volunteers about the tree planting primarily through social media communications. Community members don’t always realize that CSUN events are open to them as well, so it was considered a success to have representatives from the community engaged in this activity. This project was funded through an external grant. CSUN’s Initial Campus-Community Resilience Assessment identified extreme heat as a climate change hazard, and poor air quality as one of the climate change impacts. During CSUN’s campus-community resilience workshops, participants identified environmental risks as a concern. Additionally, participants identified developing better community relationships/networks as an element of importance related to resilience. Overall campus-community relationships and network was improved. The tree planting reinforced CSUN’s certification as a Tree Campus USA. Tree canopy cover and the temperatures close to the newly planted trees will indicate the impact of this project. CSUN Geography Weather Network measures the temperature on campus every 15 minutes to monitor and measure the urban heat island effect. The National Land Cover Database (NLCD) releases tree canopy data every five years. These databases will be used to measure the impact of the tree plantings.